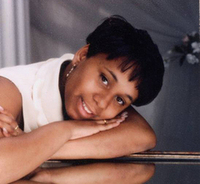 Georgette Latrice Diggs, a 23-year-old single mother of three, was murdered October 24, 2002 in her East Park Manor appartment, 587-C Howell, Muskegon Heights. Police theorize the murder occurred in the early morning hours; Diggs’ body was discovered by her then six-year-old daughter Chardanaye Diggs when she awakened and was preparing to go to school. The daughter ran across the street to her grandmother’s home to report that her mother had been injured. Also in the house at the time were Diggs’ one-year-old twins, Ashanti and Chianti Diggs. There was no sign of forced entry, leading police to say it’s likely Diggs knew her attacker well enough to allow him or her access to the apartment. In 2009, Police reported that they had what they called “a viable suspect” and were working the case. It remains active, Muskegon Heights Detective Calvin Mahan said in the fall of 2010. The children’s grandmother, Edith Oakes, has raised the three since the murder. Posted on Wednesday, December 8th, 2010 at 2:44 pm. Last updated on Wednesday, December 8th, 2010 at 2:46 pm.